Fixed bug where a relative path would not work. Have you ever wished you had a screenshot of a scene? Would you like to have a whole series of screenshots of a mission? Wait no more, Automated Screenshots is here! Have you ever forgotton to save a game, and needed to restore? 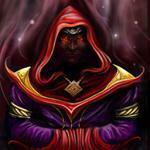 This mod will take screenshots at specified intervals. Screenshots can be taken at special events. The UI can be hidden during the screenshots. Be aware that this will be visible, the UI will flicker off and then on during the screenshot. Credit must go to magico13 for his Sensible Screenshots mod, which provided the code for the following filename functionality. Please note that this mod does NOT rename manual screenshots. The filename is fully configurable, by using variables in the file name. While this can take screenshots as fast as one per second, I wouldn't recommend taking anything faster than 1/every 5 seconds or so, just to avoid any performance problems, especially when there is a lot of physics going on. The mod will now do automatic saves at specified intervals. it will only keep a specified number of save files. The values range from 0-4. 0 is the default, 1 is the same as 0. Note that a value of 4 can take up to a second to do the screenshot. This option is extremely processor intensive, only use it if you need it for cinematics. Set this to the factor which you want your screen resolution to be multiplied by. For example, if your game resolution is 1280x720, setting the number here to 2 would give you screenshots of size 2560x1440. Use Blizzy Toolbar if available If the Blizzy toolbar is installed, use it. Altitude limit Must be below this altitude for pre-crash screenshots to be taken. very interesting, not just for the screenshots but the event triggers. Being able to capture the clock when I pass into a new SOI, for example, would be great for my timeline record when I go back and work up tweets about it later. what happens if the game is time warping? FYI, I've added this to CKAN, waiting for them to update it. Cool! to my GameData it goes. I'm away from my computer at the moment, and so can't test it out. So can someone tell me if it is possible to capture faster than at one second intervals? I think it will continue. The timer is based on real time, not game time. And special events are generated by the game. You read my mind. Very astute. Very well, this mod may not be for me, however, I believe that the telemachus mod and user variants can use something like this to stream into a browser. Possibly. I don't recommend doing anything more than one screenshot every 5 seconds, both because of performance and space. But it would be easy enough to change it to allow multiple screenshots per second. if requested enough, I may do that, but for now, would just like to see it used as is. Have you ever wished you had a screenshot of a scene? Would you like to have a whole series of screenshots of a mission? It would be cool if you could add an "about to crash" automatic screenshot event. Something like if vessel.GetHeightFromTerrain() is less than 100 m and vessel.verticalSpeed is more than -10 m/s or so, take a screenshot every 2 seconds. It'd also be cool to have the screenshots taken both with and without the UI, back to back. the "about to crash" is intriguing , I'll think about it. The multiple screenshots, can be a performance problem. Also, my code isn't designed to do more than one shot per second, so that might not work for you. As requested. It's done, download the latest. FYI, since this is a beta, there are still some logging statements which aren't really necessary. Once I get some feedback, I'll be able to remove them. Edit: Does this also rename manual screenshots? It's not totally clear to me in the OP. Your mod was the inspiration for this. This does NOT rename manual screenshots. Okay, so taking screenshots of the entire screen is possibly a performance killer if you're on a non-gaming system or if you're running a lot of mods and your RAM is already nearing maximum... so how about this (no idea if it's even feasible, just bear with me for a few moments): Have a GUI window that represents a "frame" of some sort in which the user could resize and position to fit where the screenshots are to be taken, and then have the shots only save what is at the GUI's screen coords + the height and width of the frame. Just something to mull over. Only other idea would be to allow this to interface with other screenshot automation mods so that captioned screenshots could be taken automatically as well (along with the usual caption automation variables as well, if they exist.) I don't sue any of those mods, so I can't be certain what is possible, but it's something to think about. Ummm, what other screenshot automation mods? Not sure about the frame, I'm trying to keep this small and simple. But I will think about it. What are the "special event" triggers? I've made changes to allow this mod to talk to Historian. I just need Zeenobit to add a function to Historian. For those interested, I've been working with the Historian mod to made AutomatedScreenshots able to work with it. I am happy to say that the work is complete. Currently you can get the (deleted, Zeenobit released) once Zeenobit makes his release I'll delete this. 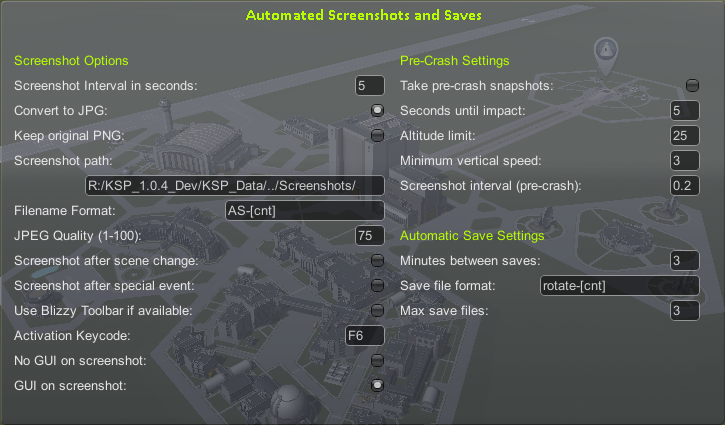 The first version of AutomatedScreenshots to support this will be 0.3.0, which I expect to release in a couple of days. Can you elaborate on this? While I haven't tested it, I'm sure that if MovieTime is running, that the screenshots will be modified by MovieTime. The timer is based on real time, not game time. And special events are generated by the game. Would it be possible to have an option to use game time for triggering the screenshots? Sometimes it is desirable to have screenshots taken at an exact interval, and using game time should automatically account for any physics lag. First, re. game time. What would you expect to happen if, for example, you set it to take screenshots every game minute, and then you are in the middle of a timewarp? Would you want it to take the screenshot of the warp, ignore it? Second, sub-second intervals. Why not just run FRAPS or OBS? How sub-second would you like? The disk space can be an issue for some people if they aren't aware of it.